World Kidney Day is March 12, 2015! Taking care of your kidneys is an important part of your overall health, and we want to help spread the word about how to keep kidneys healthy. There are many kidney conditions that can lead to chronic kidney disease, including having kidney stones. More than 1 in 10 adults will get a kidney stone in their lifetime. The number has increased significantly since 1994, when the rate was just 1 in 20. Let’s work together to reduce numbers like these, and we can start by learning some little-known facts about kidney stones. Q: If you live in the southern U.S., are you at greater risk for kidney stones? A: Yes. Studies have shown that in areas with warmer climates, where people are more likely to be dehydrated, there is significant difference in the prevalence of kidney stones. In fact, there’s a determined “Stone Belt” here in the U.S., spanning Alabama, Arkansas, Florida, Georgia, Louisiana, Mississippi, North Carolina, South Carolina, and Tennessee. And it’s expected that this belt will gradually move farther north as the climate changes. 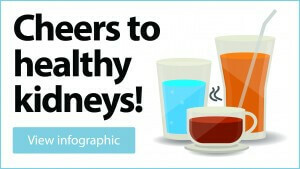 Check out our infographic to learn about the beverages that can keep you hydrated and prevent kidney stones. Q: Does your job affect your risk of developing kidney stones? A: Surprisingly, your job choice can increase your risk of kidney stones. If your job requires long periods of uninterrupted time from you, then you could be at higher risk. For example, truck drivers and flight attendants, who don’t have convenient access to restroom breaks at any time, could have a higher chance of getting a kidney stone because their kidneys aren’t being flushed out as periodically as they should be. Q: If I get a kidney stone, am I at a risk to continue getting them in the future? A: Unfortunately, yes. After a first experience with a kidney stone, the recurrence rate after one year is 15 percent, and at five years it is 50 percent. However, there are precautions and lifestyle choices you can make that can help prevent recurrence. Help us spread the word about kidney health this World Kidney Day. Drink an extra glass of water, and share our infographic!